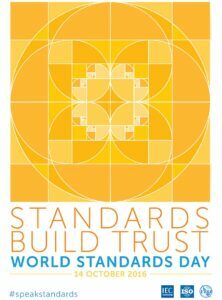 Standards connect us with reliable modes of communication, codes of practice and trusted frameworks for cooperation. Introducing common interpretations on reciprocal sides of a communication or transaction, standards are essential to mutually beneficial trade and resource efficient international commerce. Social interaction relies on common respect for fundamental sets of norms, concepts or meanings ñ international standards codify these norms to ensure that they are accessible to all. A product or service conforming to an international standard is imbued with a trusted symbol of quality, safety or compatibility. Standards speak to the diversity of our interconnected world, introducing uniformity at the interfaces where we need to be certain that we are speaking on the same terms.